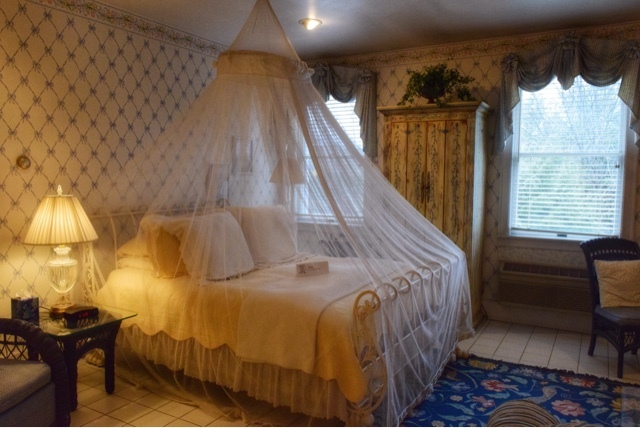 When it comes to romantic destinations outside of Pittsburgh proper, there’s two locations that have always been on my radar: Buhl Mansion Guesthouse & Spa and Tara- A Country Inn. Each property gives the ultimate romantic vibe and, whether it’s a Valentine’s Day weekend getaway or simply a place to relax and unwind, each property provides for your every need. Each is also a member of Select Registry (have you checked out its properties? So amazing!) and it’s very easy to see why- each offers the elegance of yesterday and the modern conveniences of today. Mr. Locke and I had an amazing visit to both Buhl Mansion and Tara and I’m so excited to share with you the photos and details from our visit. We were treated with glasses of champagne at check in, amenities in our guest rooms, and even nightly turn down service with a sweet treat after dinner each night. A gal could so get used to this. 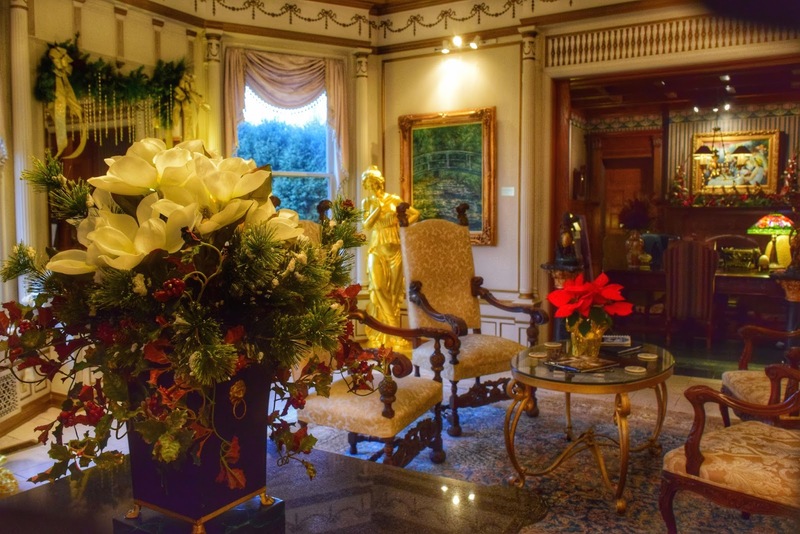 Walking through the entrance of Buhl Mansion Guesthouse & Spa was like walking through a friend’s front door. I was greeted with a smile and each moment that Mr. Locke and I spent there felt like I was home. 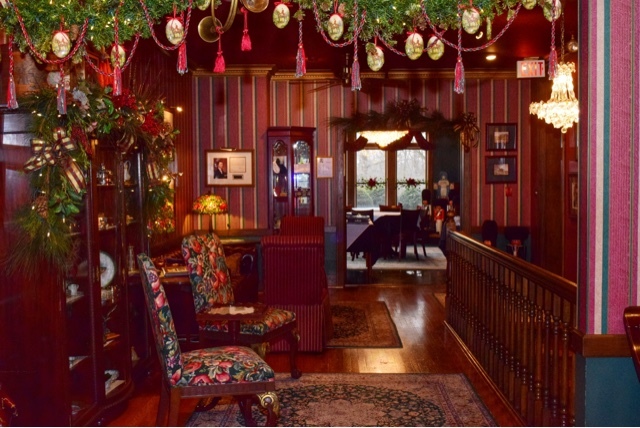 Even with its late Nineteenth Century decor, expensive furnishings, and china tea cups, the visit was laid back and so refreshing. We were catered to, pampered, and dare I say treated like royalty? Indeed, I do. Buhl Mansion has 10 guest rooms and suites so depending on your traveling style, decor preference, and budget there is a room for everyone’s taste and want. In our Steel Magnate Room, we were pleasantly surprised to find a chilled bottle of champagne, snacks, fruit, and the sweetest welcome message. Welcome amenities are the norm and are included in Buhl Mansion getaway packages- and there’s free wifi, too! Such lovely decor- and not too girly for Mr. Locke. 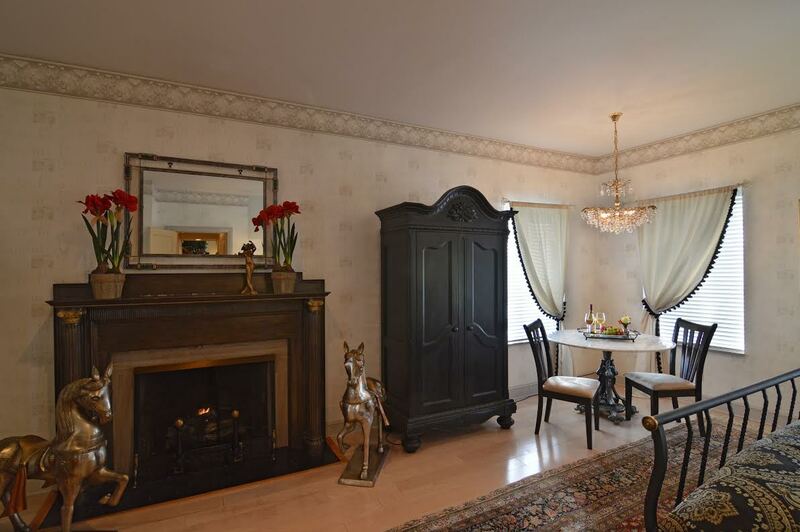 Of course, if you’re all about lace and frills there are several other rooms draped in them. After we settled in, the staff encouraged us to check out the property and its grounds at our leisure. From the library to the sitting rooms and dining areas, I was in heaven. A gal can dream, right? Such beautiful place settings in the formal dining room. Visiting in mid-January meant that the winter decorations were still up and they were that perfect touch. 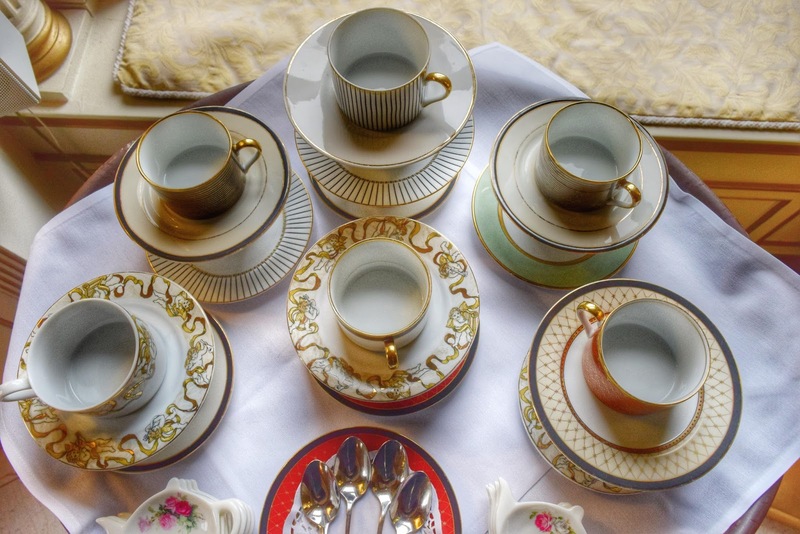 Not too long after check-in at 3pm, Buhl Mansion has the sweetest Afternoon Tea- a chance to chat with other guests and Mansion staff or simply enjoy a few moments of quite time. Mr. Locke and I sat around one of the tables and, with tea cups in hand, enjoyed finger sandwiches, fruit, and small pastries. It was the perfect way to relax on a chilly winter afternoon. 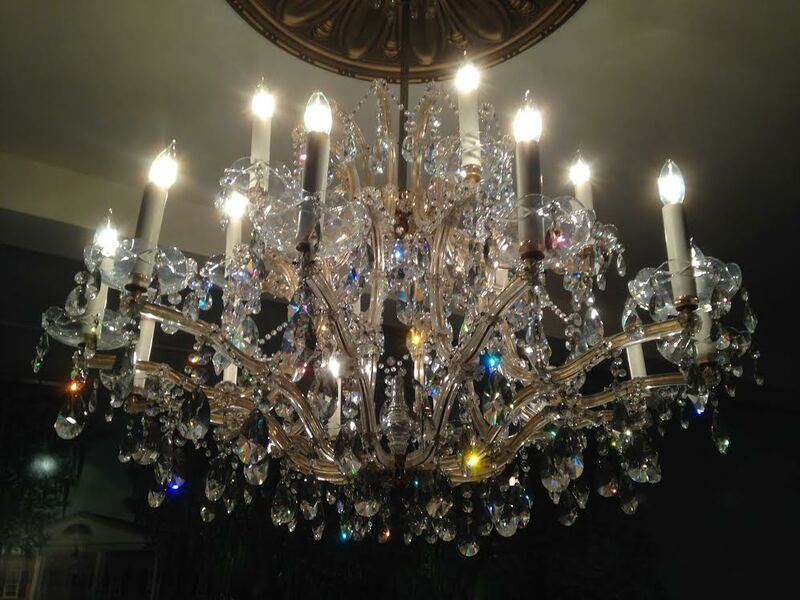 As Buhl Mansion and Tara are sister properties, Buhl provides a limo service to Tara’s dining rooms free of charge. As we were heading to Tara the next day, we chose to head into town and dine locally. The next morning, breakfast was delicious. We had the option of either ordering and having it brought to our room at the time of our choosing or heading to the main floor and dining in the breakfast room. Of course, we chose to get dressed and dine with other guests. After breakfast, I visited the in-house Spa. My finger nails were looking a bit shabby and the nail tech turned them chic in no time. The spa also includes a steam room and sauna and guests of the mansion have access to them during their stay free of charge. When we checked out for our visit, I mentioned to Mr. Locke that it felt like I gained a dozen new friends. From the management to the wait staff and housekeeping, I truly feel that way. The staff absolutely added to the luxury experience and made our visit so much more special than it would have been. 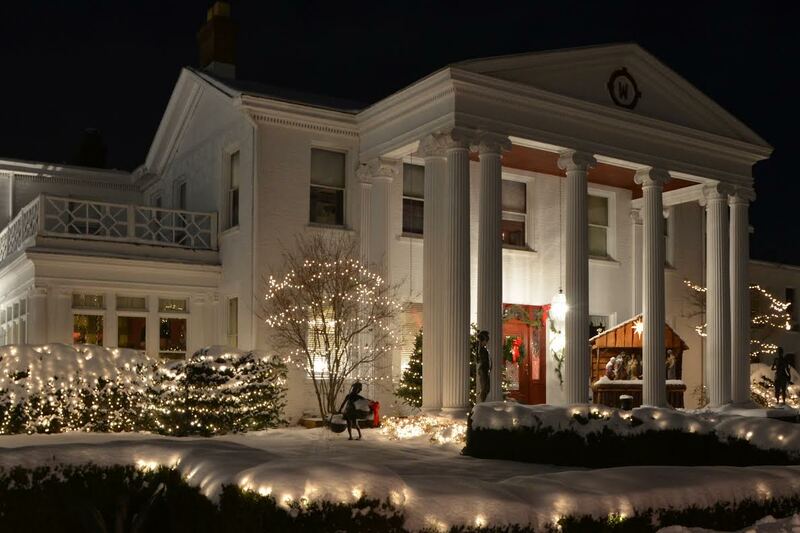 The exterior of the property is so beautifully decorated during the winter months, and you can bundle up and take a stroll around the property. 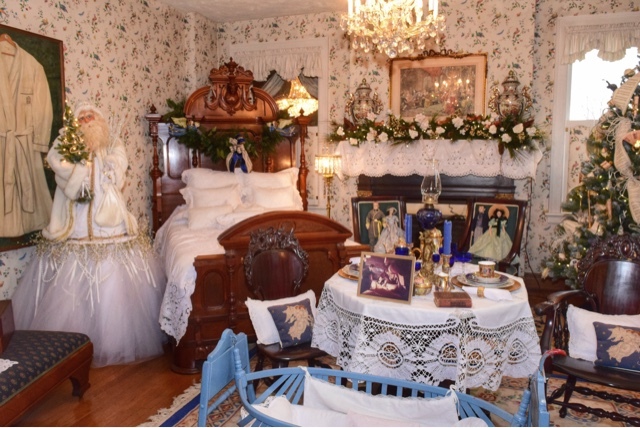 Each of the inn’s 24 guest rooms are different from the next, but each has a similar theme and inclusions. Our room for the night was Fiddle Dee Dee and with its romantic theme (and my girly-girl take on the world! ), I was all set. We had a giant spa tub, separate shower, and working fireplace that we left on all night to stay cozy. The inn offers free wifi to guests, luxury bath amenities, and cable t.v. as well. During nightly turn down service, the bed netting was pulled back and a small plate of cookies left for us. After check-in and getting settled, I just had to tour the property. There are several common rooms on the main floor including a library, bar, and sitting room where we had Afternoon Tea at 4pm. I’m such a sucker for antique furnishings, so you can only imagine the jaw-dropping I encountered around every corner. Tara was also still decorated for the winter holidays during our visit- and it looked so pretty. 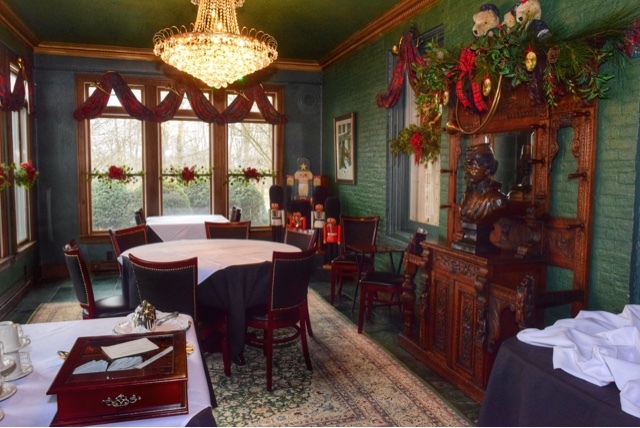 The feel of the inn compared to Buhl Mansion is only slightly less formal and the staff was all about making us feel at home. After dinner, we just had to try a glass of Tara’s famous Champagne Punch! Word to the wise, it’s delicious and goes down VERY easy. Breakfast the next day was one of two choices: delivered straight to our room or a full breakfast at Ashley’s (read below for more information about onsite dining). Two beautiful onsite restaurants are for both guests and diners that want to have incredible meals- Ashley’s Gourmet Dining Room and Stonewall’s Tavern. Ashley’s offers a formal setting (jacket and tie required) for dinner and a seven course menu. Tara signature china, silver flatware, and a pianist complete the candlelight suppers. Advanced reservations are required daily, but if you’re planning on visiting on a holiday, I’d make a ressie extra far in advance. We chose Ashley’s for breakfast and definitely weren’t disappointed. A breakfast exclusive, Broiled Grapefruit, is on the menu. With raspberry sauce and just a touch of powdered sugar, it would be super easy to make at home- and I plan on trying it for a reminder of our visit. 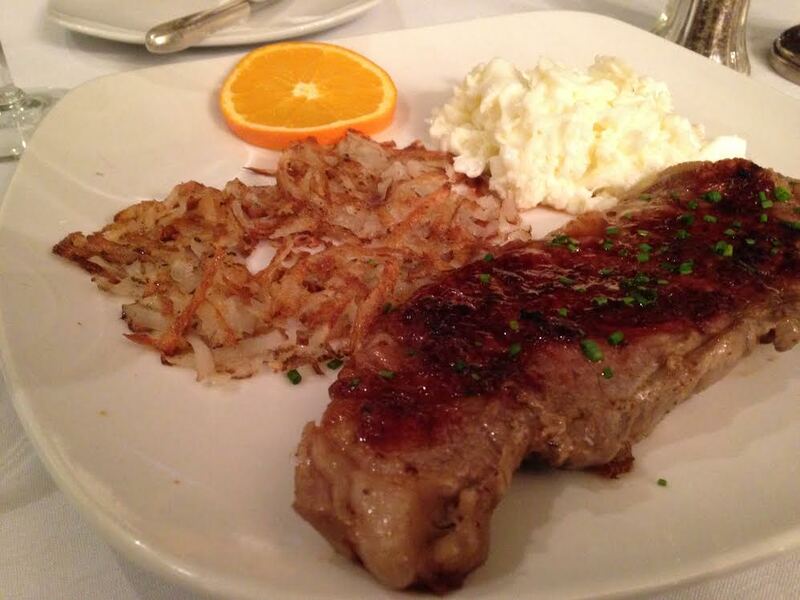 A hearty steak and eggs for me- and really delicious hash browns, too. I’m generally not a big eater in the morning but this dish I downed.Stonewall’s Tavern is a much more laid-back dining experience, and the one that we chose the night of our stay. 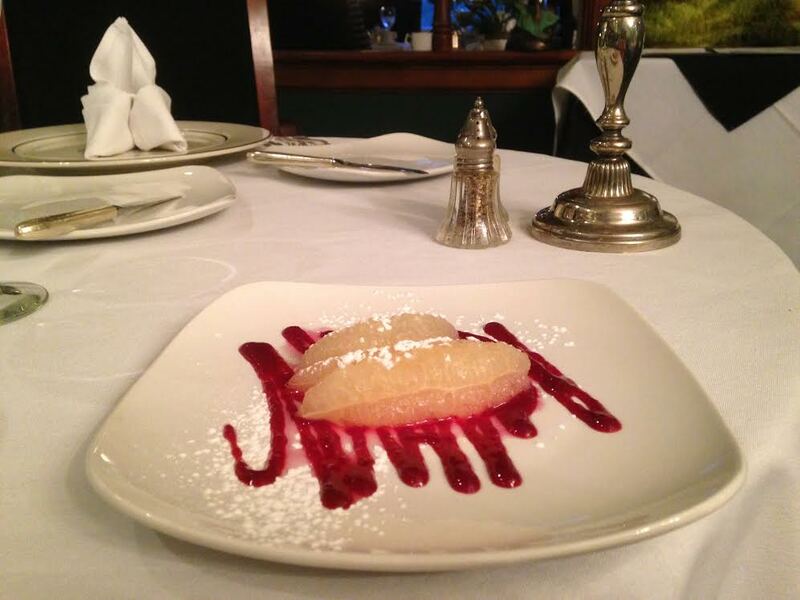 Located on the bottom level of the property, the restaurant has a lovely, low-lit ambiance, fabulous menu options including steak and seafood, and a really awesome dessert selection including its famous Grand Marnier Coffee a la Mode. Baby back ribs and a baked potato with its own fixing’s bar. The sauce is just a little bit spicy and sweet- so delicious. A tray of potato toppings came straight to the table. Mr. Locke’s Pan seared Black and Blue Scallops and a side of wild rice. The famous Grand Marnier Coffee a la Mode surround by other decadent desserts. 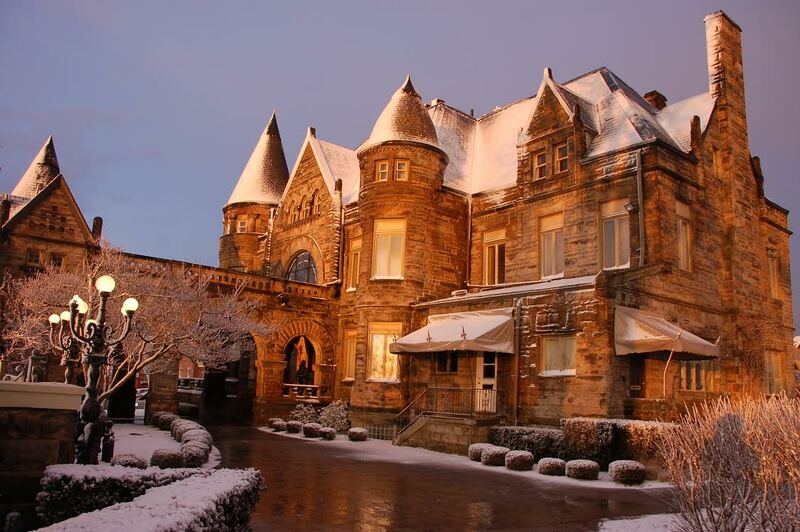 Both Buhl Mansion and Tara are beautiful, have amazing staff, beautiful decor, and offer bed and breakfast packages. If I had to choose one over the other? It would have to be Buhl Mansion, but only because I love late Nineteenth Century decor and feel. If I didn’t want to leave the property to dine, Tara would be my choice. Now, the hardest part for you is deciding, too. 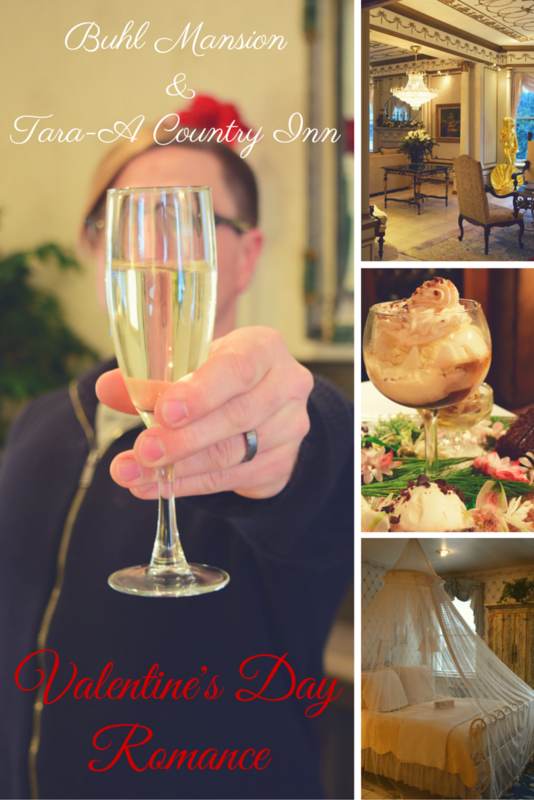 Disclosure: I was hosted by Buhl Mansion Guesthouse & Spa and Tara- A Country Inn to give you fine folks the scoop on what makes each property so great for couples. I was not asked to state a particular point of view and all opinions are my own!